Army denies killing 17 herdsmen in Southern Kaduna – Royal Times of Nigeria. The 1 Division of the Nigerian Army, Kaduna, on Tuesday debunked reports on social media that soldiers killed 17 herdsmen in Southern Kaduna. 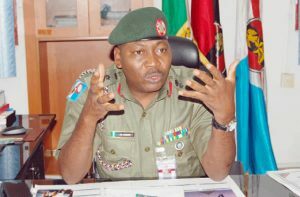 In a statement by Col. Kingsley Umoh, Deputy Director, Army Public Relations, the army dismissed the report as unfounded and irresponsible. He said; “We appeal to citizens, community leaders and other stakeholders to always speak and act in the interest of peace. “It serves no useful purposes to continue to fabricate stories about the already delicate security situation in southern Kaduna.”. “Soldiers had tracked down suspects believed to be involved in some recent security breaches in the area.